Info "Keep the balls that come out of my nose in play with the left and right flippers! Stop laughing!" 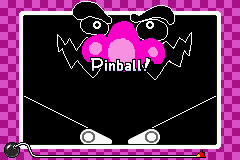 Wario Pinball is a microgame found in the Anything Goes folder in WarioWare, Inc.: Mega Microgame$!. The objective of the game is to use the pinball flippers to keep the balls from falling down to the middle of the table. If a pinball falls through the flippers, the Wario face will be surprised, ending the microgame in a loss. 1st level difficulty: The player must prevent one pinball from falling. 2nd level difficulty: The player must prevent two pinballs from falling. 3rd level difficulty: The player must prevent three pinballs from falling. This page was last edited on January 28, 2018, at 12:58.